A motivational ploy of putting him in the middle order seems to have worked in stoking Virender Sehwag’s appetite for runs, it was claimed by coach Greg Chappell in an interview today. Greg Chappell pushed Virender Sehwag down the order in the Rajkot match against Sri Lanka as a motivational ploy to help the batsman regain his form. If the Indian team returned from South Africa glum-faced after missing out on a wonderful opportunity to secure for the first time a series Test win there, they will leave for the West Indies with a smile on their faces and a spring in their step. In order to allow pacers Shoiab Akhtar and Mohammed Asif some more time to get rid of the nandrolone effect, the Pakistan Cricket Board is paying a huge amount of money to the World Anti-Doping Agency (WADA) accredited laboratory in Kuala Lumpur for urgent dope tests of World Cup-bound players. Irfan Pathan will have one more opportunity to prove his fitness and form before the World Cup as he will play for West Zone against Central Zone in the Deodhar Trophy limited-overs tournament. Punjab all-rounder Reetinder Sodhi has been ruled out of tomorrow’s North Zone Ranji Trophy one-day match against Himachal at the PCA Stadium. Viswanathan Anand wasted an opportunity to register a win from a strong position as he once again settled for a draw, splitting points with Russian Peter Svidler in the second round of the Morelia/Linares Super GM tournament here. Yaroslava Shvedova of Russia lifted her maiden WTA title by beating top seed and defending champion Mara Santangelo of Italy 6-4, 6-4 in the final of the Bangalore Open WTA tennis tournament at the KSLTA Stadium here last night. The unseeded Russian hailing from a little village near Moscow, who had shown the door to second-seeded Sania Mirza in the quarterfinal on her way to the final, looked unbeatable with her deep and accurate serves and thundering groundstrokes forcing the world No. 36 Italian into submission. A brace by Brazilian recruit Edmilson Marques enabled last year’s runners-up East Bengal to subdue JCT 2-1 in the fifth round of the 11th National Football League at Guru Nanak Stadium here today. Having taken a comfortable 2-0 lead in the first half, East Bengal conceded a goal in injury time when diminutive JCT medio Baldeep Singh headed in a curling flag kick by Rennedy Singh to narrow the margin. Maratha Warriors, who were held 2-2 after the 15-minute extra-time, edged out Sultans in the tie-breaker to win 5-3 in the second leg of Premier Hockey League III at the Sector 42 Hockey Stadium, here, today. The win enabled Maratha Warriors to bag two points while Hyderabad Sultans got one point. Ace Indian golfer Jeev Milkha Singh’s world ranking continued to dip for the second successive week as he dropped two places to the 44th spot, even as Shiv Kapur’s runner-up finish at the Jakarta Indonesia Open propelled him 28 rungs higher in the World Golf Rankings released today. Sania moves one place in World tennis rankings. “Viru was put in the middle order as a cover for Yuvraj Singh in case the latter didn’t return in time as well as to motivate him. Something has worked,” Chappell told PTI after the dashing right-hander had contributed 46 in India’s series-winning cause against Sri Lanka in Visakhapatnam on Saturday. Sehwag, who had drawn much flak in the media over his poor form of late, having failed to score a single century in the last 59 ODIs, opened the innings on Saturday and batted with characteristic flourish to re-ignite the almost dying hopes on his form and attitude. The Delhi dasher was initially projected as a middle-order batsman for the World Cup in the media by Chappell but the Australian now claims it was all a part of his plan to challenge Sehwag to reclaim his batting style. Chappell indicated in no uncertain terms that Sehwag would now bat in any of the first three batting slots in the World Cup. Sehwag has batted in 134 of his 167 one-day internationals as an opener and seems set to resume the role. As a reverse psychology, it also seems to have worked for Yuvraj, who was struggling for fitness and form and made a handsome return to form with an innings of 95 in the last game against Sri Lanka. “Yuvraj can be a critical difference during the World Cup. When he is in form, he is one of the best in the business. We need batsmen who can make the most of the middle overs. Yuvi can help us do well in that area,” said Chappell. Chappell also spoke his mind on Irfan Pathan, whose form and fitness is shrouded in mystery in recent times. Sent back from South Africa in the middle of a tour in December last, Pathan has only played one international and two first-class matches in the first two months of the year and now appears an unknown and unproven prospect for the World Cup. “Pathan is down on confidence, there is little doubt on it. And that’s because he hasn’t had much success recently. All he needs is an injection of wickets,” asserted Chappell who still feels the Baroda player in form gives the side much needed balance in both batting and bowling. “He has a role which, when he’s in form, can give the side a critical balance. It’s not his batting but bowling which is in question. But all this would change when he is among the wickets. 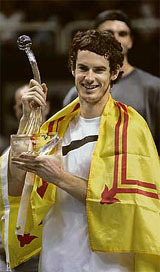 But at the moment he needs to be fit and then chances would come his way,” he said. 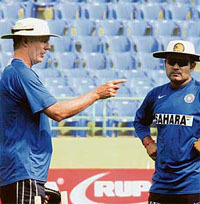 Chappell claimed that a couple of weeks in cricket could make critical difference to a team’s fortunes and cited the examples of India and Australia to back his words. “Australia, too, was a huge favourite till a few weeks ago but now it’s changed. Injuries have played a part in it. So the way things have changed and shaped up, it would appear anyone can do well if they play well. Most of the teams are fairly well matched,” he pointed out. In Chappell’s opinion, India have got as good a chance as anyone else in the biggest competition in the game. “There is no guarantee that any team would go on to win the World Cup. I have always believed that I would be happy if we make the semifinals. From then on, any of the four teams can win the World Cup,” he added. Chappell admits fielding could be India’s grey area and exhorts his batsmen and bowlers to make up for the deficiency in their respective areas in the World Cup. “As an Australian, I have strong views on fielding. But I wouldn’t ignore reality. You need to review and I am prepared to do it for better results. Delhi got a big boost with the joining of dashing Virender Sehwag for the North Zone Ranji Trophy match against Services to be played at the Sector 16 cricket stadium here tomorrow. Delhi players opted not to spend time at the nets and preferred to stay indoors. Asked to explain, Dr Sareen said: “The boys played a match at Patiala yesterday. Then again they will be playing back-to-back matches from tomorrow. It would have been too taxing if they were to practice today,” he said. The match provides an out-of-form batsman an opportunity to regain his touch ahead of the next month’s World Cup. The batting form of the swashbuckling batsman has virtually been the biggest concern of the Indian think tank ahead of the mega event. Otherwise a proven match winner, his performance during the past six months has vacillated between bad and worse. Worse still, the intrepid batsman, known for his daredevilry with the bat, showed little inclination to stay at the wicket. The confidence reposed in him, particularly by skipper Rahul Dravid, seems to have finally paid off. Thankfully, the last one-day match against Sri Lanka at Vishakhapatnam in the four-match series which India won 2-1, provided the silver-lining. Though unfortunately, a lackadaisical Sehwag ran himself out when he looked set for a big knock, his stay at the wicket would do a world of good to his confidence. During his stay at the wicket, Sehwag gave glimpses of the batsman of the old before his rather cavalier approach led to his down fall. Asked about the performance of Ashish Nehra, Dr Sareen said though fit, left-arm seamer has failed to strike rhythm. “Ashish has been bowling well, but has somehow failed to do much.” After being in wilderness and remaining out of the Indian squad for nearly a year on account of injury, Nehra has been working hard to regain berth in Indian squad. Though being favourites in the tomorrow’s match, Sehwag,s inclusion will further strengthen the side. Leg-spinner Abhishek Sharma has been included in the squad in place of Chetan Nanda, Dr Sareen said. If the Indian team returned from South Africa glum-faced after missing out on a wonderful opportunity to secure for the first time a series Test win there, they will leave for the West Indies with a smile on their faces and a spring in their step. The BCCI decision to have the two four-match series may well have been to help their media partner recover some of its investments but it turned out to be a god-sent chance for a team down in the dumps after the South Africa tour. Sure, it could have gone the other way too if the Indian team had lost the series to the West Indies and especially to Sri Lanka, who are in their group for the World Cup. These games gave the selectors the scope to experiment which they did partially and it also afforded some players the chance to seal a place for themselves in the World Cup squad. The matches also allowed the selectors to check out the fitness of some of the injured players and Munaf Patel and Yuvraj Singh came through with flying colours. Yuvraj’s sparkling batting in the final one-dayer against Sri Lanka was the icing on the cake for India. Not only did the left-hander field as brilliantly as he usually does but he also struck the ball long and hard and in the company of Sourav Ganguly made a challenging target look pretty common. Robin Uthappa, Rahul Dravid, Sachin Tendulkar and Mahendra Singh Dhoni played fine innings during the series to give India’s batting a nice healthy glow about it. Uthappa, Ganguly and Yuvraj did not play in the one- dayers in South Africa and thus did not suffer from the trauma of defeat in these games. They came in with a fresh burning desire to make the most of the opportunities that the ODIs provided and did so with élan. Ganguly getting the man-of-the-series award does bring into question why he was left out of the one-day squad at all as also the omission of Uthappa from the team to South Africa. But this is not the time to look back but to look ahead and hope that any misunderstandings and bad blood are over and done with. In the bowling department, Zaheer Khan continued his impressive comeback, giving early breakthroughs every time and with Ajit Agarkar bowling cannily and Munaf also picking wickets, the Indian bowling line-up looks pretty settled. Both Kumble and Harbhajan may not have been among the wickets but they bring a lot of experience to the party and they were never really collared by the batsmen. The fielding was more than capable in the series and with a bit more work should be able to hold its own in the World Cup. The Sri Lankans were without two of their most experienced cricketers, Muthiah Muralitharan and Chaminda Vaas, and that made the difference as the Indians were able to get to big targets without too much worry. The strength s of the Sri Lankans have been Vaas’ ability to get early wickets and Muralitharan’s knack for picking up wickets as well choking the run flow in the middle overs. The laboratory will take some extra charges to conduct the dope tests and send the results within 48 hours. According to a report published in The News, a PCB official said more money was being paid for the tests to allow maximum time to Akhtar and Asif to flush out traces of nandrolone in their blood. Though it was known how much money the PCB would pay for the dope test of 20-odd players, the official said that “it is quite substantial.” “I believe the two players would get one more week before their urine samples are collected and sent to Malaysia for the dope tests,” he said, adding “it would allow them some extra time which may help them pass the test.” The official said the seamers, who were earlier banned for testing positive for nandrolone and later let off by an appeals committee of the Board, could be tested by February 26, 10 days after the PCB took samples from majority of their players in Lahore. The Board carried out dope tests of all the players apart from Akhtar, Asif and Shahid Afridi, who is presently abroad playing a charity match. Afridi is likely to be tested in a couple of days. Meanwhile, the two pacers, who are in Pakistan’s 15-member World Cup squad and are carrying injuries, separately went to England and speculation is making the round that they were sent to consult renowned sports lawyer Mark Gay. The London-based Gay has previously worked for the PCB following the Oval Test fiasco and last October’s doping scandal. The legal advisor has played a major role in lifting of the ban on Akhtar and Asif. But the PCB official rejected such speculation, saying the players went to England to seek medical advice on their injuries. Pathan was today included in the West Zone team for the opener at Ahmedabad under Mumbai’s Ranji Trophy-winning captain Amol Muzumdar before leaving for the West Indies with the Indian team for the World Cup on February 28. Sodhi, who had to miss previous two matches against Delhi and Services on account of food poisoning, is on way to recovery but is not fully fit to play. After notching up two successive victories in the previous matches, Punjab are sitting pretty. With not much time remaining - the last match against Jammu and Kashmir is slated for Wednesday - Sodhi’s further participation in this phase of the tournament looks rather bleak. Punjab’s first match against Haryana here was washed out. Anand, who earlier drew his first-round game against Bulgarian Veselin Topalov, had to be satisfied with another draw, which took his tally to one point. The Indian occupies the joint third position and is half a point behind leaders Vassily Ivanchuk of Ukraine and Norwegian GM Magnus Carlsen. Unlike the first-round game when he settled for a quick split of points, Anand - playing with white - overcame several technical difficulties in the second-round game played on a Ruy Lopez format to be in a advantageous position. However, Svidler did not let the Indian capitalise and the two players eventually agreed for a draw after 47 moves. Meanwhile, the shock of the day came when Veselin Topalov, a pawn down against Vassily Ivanchuk, committed a blunder to lose the match. Yaroslava Shvedova of Russia lifted her maiden WTA title by beating top seed and defending champion Mara Santangelo of Italy 6-4, 6-4 in the final of the Bangalore Open WTA tennis tournament at the KSLTA Stadium here last night. The unseeded Russian hailing from a little village near Moscow, who had shown the door to second-seeded Sania Mirza in the quarterfinal on her way to the final, looked unbeatable with her deep and accurate serves and thundering groundstrokes forcing the world No. 36 Italian into submission. In a match that belonged to the teenaged Russian ranked 143, Yaroslava executed superb backhand strokes and repeatedly placed the ball well out of the reach of Mara. A vital break in the third game gave Yaroslava an early 2-1 in the first set. She won the set in just 44 minutes. In the second set, Yaroslava broke her opponent in the second game and kept on the pressure to race to a 3-0 lead. Mara did her best by saving three game points at 3-4, but a determined Yaroslova, despite committing a double fault in the 10th game, recovered well and served an ace to take lead. The 25-year-old Mara, despite taking chances, could hardly do anything against the marauding Russian. Yaroslova finished the set and the match with a superb backhand stroke to pocket $25,840. With today's victory, East Bengal have jumped to the second position with ten points from five outings. In what was perceived to be a close contest, East Bengal held a firm grip on the proceedings in the first half with Edmilson, lanky Kenyan striker Boniface Ambani and Japan-born Indian midfielder Izumi Arata displaying perfect understanding. Such was East Bengal dominance that JCT’s fall appeared imminent from the onset. In fact, new Brazilian recruit Edmilson could not have dreamt of a better debut on Indian soil. Having arrived in India on January 23, the 26-year-old Edmilson, formerly of Rio de Janeiro’s Bawnara Club, justified his selection by coach Carlos Roberto Pereira da Silva with two brilliant strikes in the first half. He was later adjudged man-of-the-match. According to team manager Swapan Ball, who was in Brazil on a recruitment mission, medio Cristiano H. de Oliveira and Edmilson have been picked on recommendations of the coach and the former had accompanied him to India in November. The chinks in JCT’s defence were exposed in the first session as regular stopper back Harpreet Singh, nursing an injury, was replaced by Nigerian recruit Sunday Ambrose. The tall and stout Nigerian, playing his first match, looked a bit off colour providing East Bengal the right opportunity. The match was hardly 12 minutes old when the hitherto unknown Edmilson latched on to the ball on top of the box. Eyeing a gap, the Brazilan unleashed a powerful shot to the right of JCT goalie Karanjit Singh to give his side the vital lead (1-0). JCT did make occasional forays mainly through Nigerian striker Edeh Chidi and Sunil Chhetri but the East Bengal defence comprising Vincent Pires, Covan Lawrence, M. Suresh and Saumik Dey seldom let down their guard. East Bengal were served well by Izumi Arata, skipper Alvito D’ Cunha, Jayanta Sen and Ambani although the coach did try out youngsters like S. Malswamtluanga and Vimal Pariyar at the fag end. In fact Pariyar, formerly of Tata Football Academy, was inducted when only two minutes were remaining for the proceedings to end. The Kolkata outfit’s sustained pressure bore fruit in the 30th minute when they consolidated the lead through Edmilson. Izumi Arata, moving in tandem with Edmilson, relayed a quick pass to the advancing Brazilian after hoodwinking the defence inside the box. Without wasting a second, Edmilson booted the ball to the left of the JCT custodian, sending a wave of joy among his team-mates (2-0). JCT displayed better understanding in the second half. Soon after resumption, a long ranger by Sunil Chhetri was collected by Rajat Ghosh Dastidar and then Baldeep, who had managed to outpace Alvito D’Cunha, dispatched a grounder parallel to the goal-line which was again collected by the East Bengal custodian. A free kick by Rennedy Singh in the 62nd minute brought out the best in Dastidar under the East Bengal bar who parried the ball over for a corner. It was in the 70 minute that JCT missed a gilt-edged chance. Nigerian forward Adebayo Tokunbo raced into the box and had only the goalkeeper to beat but he only managed to send a gentle lob into the safe hands of Dastidar. Thereafter, Baldeep (Junior) was the culprit as he shot over from close range. Edeh Chidi also made a good attempt towards the end but his firm right footer was punched away by the East Bengal goalkeeper in the nick of time. With the match extending into injury time, it seemed it was all over for the mill men but a curling flag kick by Rennedy Singh was headed home brilliantly by the hard-working Baldeep Singh, giving his side some consolation (1-2). With today’s defeat, JCT remain stranded at the sixth position. Maratha Warriors are now jointly sharing the second place with Sher-E-Jalandhar, after garnering 16 points. In the tie-breaker, Shivender Singh, Jamie Dwyer and Gaurav Tokhi scored for Maratha Warriors while Sandeep Antil failed to score. For Hyderabad Sultans, the first three players missed their chances. Sardara Singh shot over the bar, Rajwinder Singh sent it wide and Lazarus Barla's ball too went out of play. Only Tariq Aziz scored and it was 2-1 in favour of Maratha Warriors. Warriors’ fifth player Gaurav Tokhi managed to beat Devesh Chouhan to fashion the match-winner. Earlier, it was Maratha Warriors who took lead in the 28th minute through a field goal. Jamie Dwyer, the mercurial Australian forward, dodged the defenders and put Chandrakesh in possession. The latter’s shot was saved by goalkeeper Devesh Chouhan but Shivender shot home the rebound (1-0). Ten minutes later, Hyderabad struck the equalizer from their third and last short corner in the 38 th minute when Didar Singh, who made amends for his earlier lapses during the set-piece drill, sounded the boards with a stinging drag-flick. (1-1). However, Maratha Warriors took the lead again in the 46 th minute through a superb field goal where Jamie Dwyer was in the thick of action once again. Shivender Singh, the other Warriors’ player who excelled on the day, sent a cross into the circle and Jamie shot towards the left post for Hardeep to score (2-1). Thereafter, Hyderabad held more ball possession and made repeated raids but lost many opportunities. In fact, they had better circle penetration in the second half but failed to finish their moves. However, they scored the equalizer in the 63rd minute to push the match into the extra-time. Sardara Singh moved into the circle from the right and dodged past Viren Rasquinha and shot from a narrow angle. Warriors' custodian Adrian D'Souza saved the ball but a weak clearance by Kuldeep Singh saw Shakeel Abbassi on the right and the Pakistani star found the target without any fuss (2-2). Shiv recovered his form after a disastrous Malaysian Open and was the biggest mover among the Indians as he climbed up from 186th spot to 158th in the leaderboard, with 1.02 average points. Jeev did not play the Indonesia Open that ended yesterday but his 2.46 average points are still the third best among Asian golfers, behind only to the Korean duo of Cho Kyung-Ju (24th) and Yang Yo-Eun (31st). Compatriot Jyoti Randhawa also slipped one spot to 89th, although his standing of fifth in the Asian list remained intact. He now has 1.57 average points. Gaurav Ghei was placed 245th, while Arjun Atwal was ranked 315th, ahead of Kolkata lad SSP Chowrasia at 358th. However, there was no challenging the leaderboard topper Tiger Woods, although his average points decreased to 19.27 from 19.64. His nearest rival Jim Furyk still has a long way to go with 8.70 average points.